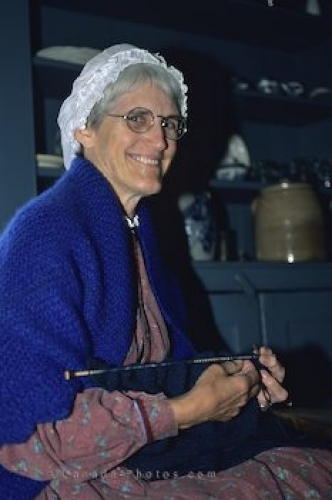 A lady knitting in her home in the historic Upper Canada Village in Morrisburg, Ontario, in Canada. Life was simple back in the 1860's and when you visit the Upper Canada Village in Morrisburg, Ontario people in costumes bring the past life to you. This lady sits wrapped in her shawl and bonnet as she whilst away the hours knitting a beautiful handmade garment. Upper Canada Village, Morrisburg, Ontario, Canada, North America. Picture of a woman knitting sweaters at the Upper Canada Village in Morrisburg, Ontario.